Como is a miniscule city of Romanesque carvings, sumptuous silks, hillside hikes, famous scientists (Pliny, Volta), and waterfront promenades anchoring the southwest corner of Lake Como. The town center retains a spectacular cathedral, squares lined by Renaissance half-timbered houses, and the church of San Fedele with early medieval frescoes and carvings (tel. +39-031-267-295; closed noon–3:30). 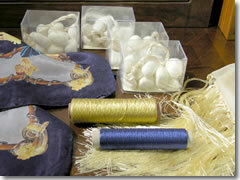 (Photo courtesy of the Museo della Seta, Como) Como has been Italy's silk capital since 1510. While they now import the spun thread from China, the fabrics Como's seta (silk) artisans weave is still the most sought-after by Milan's top designers. Tempio Voltiano. (Photo courtesy of APT Como. )Just off the lakeside Piazza Cavour, Como has the expected sun-drenched waterfront promenade, but it's an unexpectedly informative one. Beyond a 1983 memorial to European Resistance fighters of World War II inscribed with some moving quotes from people who sacrificed their lives, a small round neoclassical temple sits on spit in the harbor. This is the Tempio Voltiano, and it houses a modest museum dedicated to hometown physicist Alessandro Volta, who invented the battery in 1800, whereupon Napoléon made him a count and the scientific community adopted his name for electrical units. The Tempio Voltiano at Viale Marconi (tel. 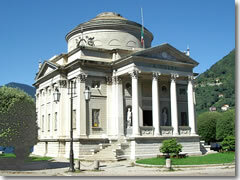 +39-031-574-705; museicivici.comune.como.it). It's open Tuesday to Sunday 10am to noon and 3 to 6pm (2pm–4pm Oct–Mar). On the main square, next to the black-and-white-striped Broletto (medieval town hoall) rises the Cattedrale S. Maria Assunta, Cuomo's Duomo. The Duomo was begun in 1396, but not capped with its Juvara-designed dome until 1740. The cathedral façade is a wonderful panoply of Gothic carvings sort of stuck helter-skelter, running up the pilasters and ringing the doorways with no order whatsoever in a gleeful lack of theme, symmetry, or ecclesiastical theory. 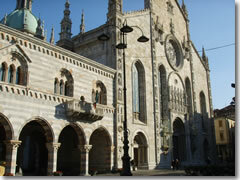 The facade of the Como Duomo. (Photo by Sailko) Interestingly, the Plinys—uncle and nephew, ancient Roman hometown heroes, and most excellent pagans both—have a place of honor, flanking the main door. The church interior preserves some nice altarpieces and nine 16th-century tapestries designed by Alessandro Allori, Giuseppe Arcimboldo, and Louis Karcher and produced in Flemish, Florentine, and Ferrarese workshops. The giant gilt altarpiece of 1509-14 tells the life story of the local patron and protector Sant'Abbondio, but even better is the church dedicated to him outside town. The Duomo is at Via Maestri Comacinni 4 (tel. +39-031-300-610; www.diocesidicomo.it). 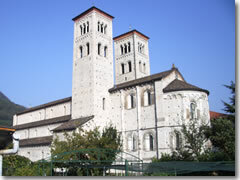 Basilica of Sant Abbondio, Como. Standing forlorn in Como's industrial suburbs, the Basilica di Sant'Abbondio is a solid Romanesque church raised by Benedictines between 1050 and 1085 on the edge of town, near the train tracks (or rather, where the train tracks are now, as the medieval Benedictines didn't have railroads). The church retains the pair of belltowers and extended choir that architecturally link it the Westkerk style of medieval Germany (though it's the work of local masons). Frescoes in the apse of the Basilica di San'Abbondio, Como. 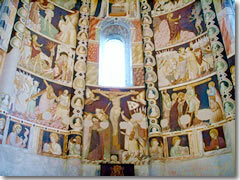 (Photo by Sailko) The apse was gorgeously frescoed in the 14th century with a comic book of Biblical scenes that, thanks to a restoration, are as vividly colored as day they were painted. The rather wide altar houses a trio of silver-faced bishops resting in peace side-by-side in their colored robes and clutching mighty shepherd's staffs. The Basilica di Sant'Abbondio is on Via Sant'Abbondio at Via Regina Teodolinda (Via Sant'Abbondonio is the continuation of Via A. Gramsci across Viale Roosevelt (tel. +39- 631-338-8111; www.santabbondio.eu). It is open daily 8am to 6pm (to 4:30pm in winter). On the northeast end of town, by the lakeside, the Brunate Funicular cog railway leads from a landing stage a short boat ride from Como's harbor up to a hillside village-with-a-view. Not only are the vistas over Como and the lake spectacular, but there are also plenty of trailheads up here for walks in the hills (the tourist office has maps). The hillside has been a chichi suburb since the 19th century, and it's littered with 100-year-old villas and pricey modern homes. Como's Brunate Funicular is at Lungo Lario Trieste (tel. 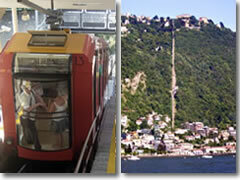 +39-031-303-608, www.funicolarecomo.it) on the northeast end of town. It runs every 15 or 20 minutes from 6am to 10:30pm and the ride up the mountain takes only 7 minutes. 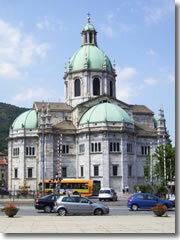 Como visitor information: The Como tourist information office is at Piazza Cavour 17 (tel. +39-031-269-712; www.lakecomo.org). In summer, here is often also a mobile information kiosk parked somewhere around the Duomo. Also check out www.lakecomo.com. Take the Ferrovia del Nord train from Milan's Cadorna station (not Milano Centrale station) to Como Nord Lago station, a block from the lake on the east side of the old center (1–2 trains per hour from Milan; 1 hr.). 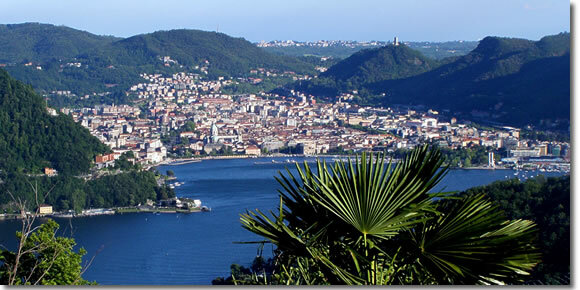 Buy a ticket on Ferrovie Nord rail line (www.ferrovienord.it) to "Como - Lago." Board the train to Milan—but be sure to get off at the Saronno station, where you transfer (quickly; the layover is about 10 min.) to the Como line. There are about 2–3 trains per hour; total travel time is 60–80 min; it costs around €8.75. Some summers, Autostradale (www.autostradale.it) offers direct bus between Malpensa and Como by way of Varese; check to see if it's on when you travel. How to get to Milan Malpensa airport from Como: If you stayed last night in Como, in the morning grab the Ferrovie Nord rail line (www.ferrovienord.it) from Como to Saronno, where you transfer (quickly! the trains don't stop for long) to another line out to Malpensa Aeroporto for your flight (2–3 trains per hour; total travel time: 60–80 min.). Some summers, Autostradale (www.autostradale.it) offers a direct bus between Malpensa and Como by way of Varese; check to see if it's on this year. If you don't take a tour or have a rental car, the easiest way is by bus (www.sptlinea.it) or by boat (www.navigazionelaghi.it). Buses are a little cheaper and more frequent, but Lake Como ferries are faster and way, way more scenic—especially since many of those amazing villas with their fabulous gardens are protected behind high walls on the landlubbing side—but from the water, you get a full-on view. Bring binoculars (and hey: you might even see George Clooney! ).